"Money for growing trees on degraded land? Who could have thought of that," wondered Mani Ram, a resident of Ranhog in Solan district, Himachal Pradesh. The village has cautiously committed 32 of 83 hectares (ha) of government common land to the Himachal Pradesh Bio-Carbon Reforestation Project, the state government's clean development mechanism (cdm) initiative. cdm is an arrangement under the Kyoto Protocol allowing developed countries to invest in projects that reduce greenhouse gas (ghg) emissions in developing countries. In this case, countries like Spain, Sweden, Japan and Canada have invested in the project through the World Bank's Bio-Carbon Fund.The bank set up the fund to facilitate projects that sequester carbon in vegetation and soil. 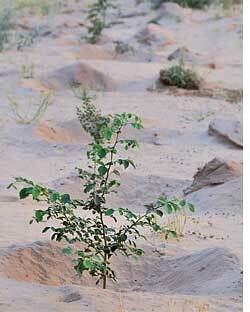 Currently, China is the only country to have an operational reforestation project under cdm. 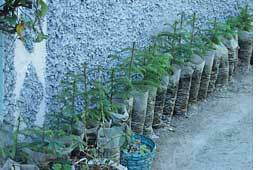 In India, both Himachal Pradesh and Haryana are in nascent stage of a reforestation and afforestation project under cdm. The projects entrust people with the task of growing and protecting plantations and their success depends on how long the state governments are able to hold people's interest. People could lose interest because financial returns are low in the initial years. Payments are based on the amount of certified emission reductions (cer) generated. cer is a unit to measure ghg sequestration; one cer is equal to one tonne of ghg. Villagers in both the states said they agreed to be part of the project because they hoped to get water for their farms and timber from unproductive land. Ranhog learnt about the project at a gram sabha last year. The forest department held several meetings to discuss the project. After its approval, the village selected the tree species it wanted. 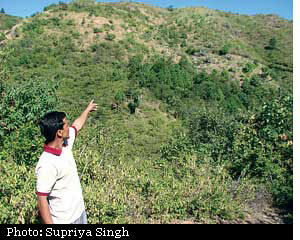 "We will plant chir pine on the upper slopes and walnut, reetha and bamboo on the lower slopes. We have banned grazing on the 32 ha for fodder development," said Ram. He added that there was never enough water to irrigate farms and that they wanted to build checkdams in the catchment of the Gambar nala, the closest source of water for the village. Due to loss of tree cover in its catchment, also the common land, the water flow in the nala had become negligible and there were no structures to hold the water. The traditional kuls (water storing structures) had silted due to soil erosion. "If the catchment can be saved by planting trees, the village will get water for irrigation," said Ishwar Singh of Ranhog. The bio-carbon project aims to cover 274 panchayats and about 10,000 ha of degraded land, spread across forest, community and private land. Of this, the state's forest department, in charge of the project, has carried out reforestation on 1,000 ha. Besides forming a carbon sink, the project aims to give farmers cash incentives and meet their needs of small timber, firewood and minor forest produce, and provide employment opportunities in the long run. The project is part of a larger Mid-Himalayan Watershed Development Project, also called the mid-hills project, in the state, which covers 602 panchayats and 20,000 ha. In Ranhog village, reforestation would be carried out on just the common land. A few Ranhog villagers told Down To Earth that the forest department had assured them that villagers would continue to have all rights over the land. To identify the project area, the forest department has done a preliminary study involving verification of satellite data since 1989. Land should be degraded since December 1989 to be eligible for cdm-reforestry projects, rules a directive of the unfccc (United Nations Framework Convention on Climate Change), the body that validates a cdm project. The project design document of the bio-carbon project is completed and the validation process is expected to begin in December. Worth us $937 million, the World Bank Bio-Carbon Fund has given about us $4 million to the Himachal Pradesh forest department for the project design document and plantation work. The project is expected to sequester about 500,000 tonnes of CO2 equivalent ghg in 20 years. A team of experts will certify the amount of carbon sequestered or cers, every five years. "The state government is yet to negotiate the price of cers because the Emission Reduction Purchase Agreement is not finalized. The state may set the sale price of each cer between us $4 and us $8," said R K Kapoor, Conservator Forests and head of the bio-carbon project. For industrial and energy cdm projects, though, cers are priced at us $9-10 in India and listed at us $20 at the European Climate Exchange. "cers from afforestry projects are priced low because of the uncertainty of the amount of carbon sequestered. For all you know, the trees may be cut down anytime. Besides, calculations related to cers are convoluted," said N H Ravindranath, member of India's cdm board and adviser to the state government on the project. He added that us $4 was an indicative price and that the final projection would be done after plantation, valuation and monitoring started. Non-availability of forestry cers in the current cdm market could also be the reason for the low pricing of cers. "This will be the second reforestry project in the world; if the supply of cers is assured, the price will go up," said Avay Shukla, forests secretary, Himachal Pradesh. If the us ratifies the Kyoto Protocol, the price of cers will increase 10 times, Ravindranath said. When the state government conceived the project last year, it projected that at us $4 per tonne of CO2 sequestered, the state would generate more than us $20 million over 20 years. Forest department officials calculated that the money translated into about us $80 per ha per year. Community user groups would be formed to undertake project activities and allocate funds to signatories. For disbursement, the funds would flow to the chief project director, over to regional directors and then to the bank accounts of the community user groups or private individuals. In case of forestland, 90 per cent of this money would be given to the communities and 10 per cent would go to the forest department for logistics and support. Of the money given to communities, 80 per cent funds would be distributed among the user group members responsible for the protection of the area and 20 per cent would go to the panchayat fund to carry out approved gram panchayat watershed development plans under the mid-hills project. For community land the entire fund would go to the gram panchayat. It would distribute 80 per cent of the money to the user group members according to their share or rights over that land. The remaining would again be used for watershed development activities. For private land the entire amount would go to the owner. Typically, money from cers flows in every five years. But, for the bio-carbon project, the World Bank will pay people from the second year, based on sequestration estimations, Shukla said. The cdm board in India approved an afforestation cdm pilot project in Sirsa district early this year. Unlike the Ranhog project, all the beneficiaries inSirsa are 227 private landowners from eight villages. An eu-funded social forestry project that concluded in 2007 motivated the forest department to take up cdm activity, said S S Sheoran, Divisional Forest Officer, Community Forestry, Haryana. The project covers about 370 ha of private land. Initially, it was planned on 1,000 ha but many farmers backed out during consultations. Some farmers did not want to commit land for 20 years; others were hopeful that irrigation could be secured in the near future and they would farm; the rest wanted to sell their land. A user committee, which comprises 16 members, has also been formed. Since this is a pilot project, the forest department will look after the plantation for three years and then hand over the responsibility to the user committee. The choice of trees included totilis (Israeli keekar), jhand (Khejdi), eucalyptus, kikar (Nilotica), sheesham, beri and ailanthus. The plantations started in August this year, using money from the state government. "The land assigned for plantation is barren. So we signed the agreements," said Maniram Punia, sarpanch of Gudiakhera village. Another farmer from the village has given a little more than one hectare to the project. "This land is rain fed and barren, so it is better under plantation than crops. I will get money for the plantation and after 20 years I will harvest the wood from the trees," said Rameshwar Punia of Gudiakhera. Not all the villagers were easy to convince. Madhosinghana village had no prior experience of social forestry and a lot of the farmers were in two minds. "I will surely consider a move to agriculture if a proper irrigation network is created for my 2.5 ha," said Javarjung Singh. But there are unanswered questions about who will pay for the plantations. Approval for more funds to extend plantations is pending with the state government. The cer selling plan is also not in place. Sheoran said that after validation, the cers will be sold through the eu- Emission Trading Scheme. The project hopes to sequester 11,591 tonnes of CO2 equivalent ghg every year. With a speculative price of us $5 per tonne of CO2 sequestered, people would get about us $130 per ha annually, a forest department official said. Of course, the figures may change based on the market for afforestry cers, he added. Inclusion of private land has other bindings too. "It is tough to keep people motivated to be with the project for a long time. The next generation may back out or sell the land," Sheoran agreed. The forest department too has no money to spare for the user committee. The head of the committee demanded a central office where all the members could meet, the transport arranged and other logistics, but these were not granted. Despite problems, there seems to be considerable potential in the sector. The Intergovernmental Panel on Climate Change's (ipcc's) third assessment report revealed that deforestation was the second single ghg source contributing 20 per cent of human ghg emissions. Brazil and Indonesia deforest enough to negate 80 per cent of Kyoto gains, the report said. It added that 420 million ha is available for afforestation in developing countries and that if all that land were afforested, assuming that one ha of forests sequester 10 tonnes of carbon per year, the sink would be about 4.2 billion tonnes of carbon per year. This is about two-thirds the fossil fuel emissions. But uncertainty over cers is a major drawback. "Methodologies to calculate the amount of carbon sequestered by different varieties of trees as well as calculating sub-soil carbon are challenging because of lack of data," said Ravindranath, the cdm board member. "How can one prove that the gains from land under cdm are more than what people would make through alternative uses of land?" he asked. In addition to these factors, high costs involved may deter small institutions from getting involved with cdm projects. The project design development cost for Sirsa was a little more than us $16,000 and the World Bank spent us $4 million on the project design document and preliminary plantation in Himachal Pradesh. Ravindranath pointed out that as the number of experts in the field would grow, costs would come down considerably. "Right now, there are very few projects and fewer experts who validate and evaluate reforestry and afforestry cdm projects," he added. It will take a while before the benefits of such projects can be gauged completely. But because of its perceived advantages of bringing about development by involving local people, states like Karnataka, Uttarakhand and Jammu and Kashmir too want to join the league. They have approached the World Bank for taking up similar projects. However, afforestation and reforestation under cdm are not the only means to sequester carbon. Stemming deforestation is also being stressed upon. Experts agree that tanding forests are the most important territorial reservoirs to CO2. There should be policies towards that, they say.